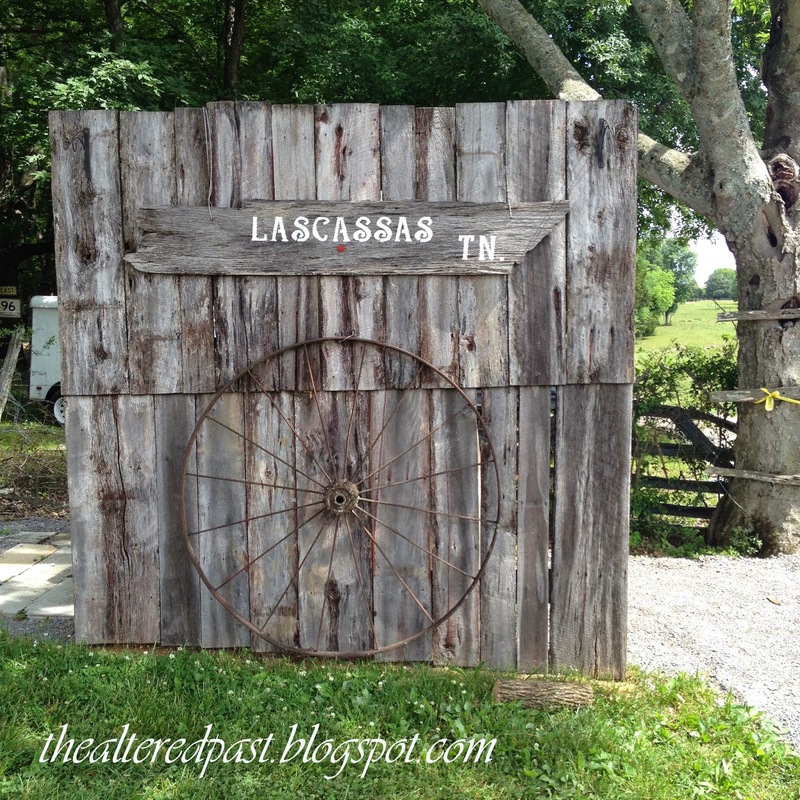 This morning, my youngest and I attended the Pick-It Fence Vintage Barn Sale, right here in our little town of Lascassas, Tennessee. 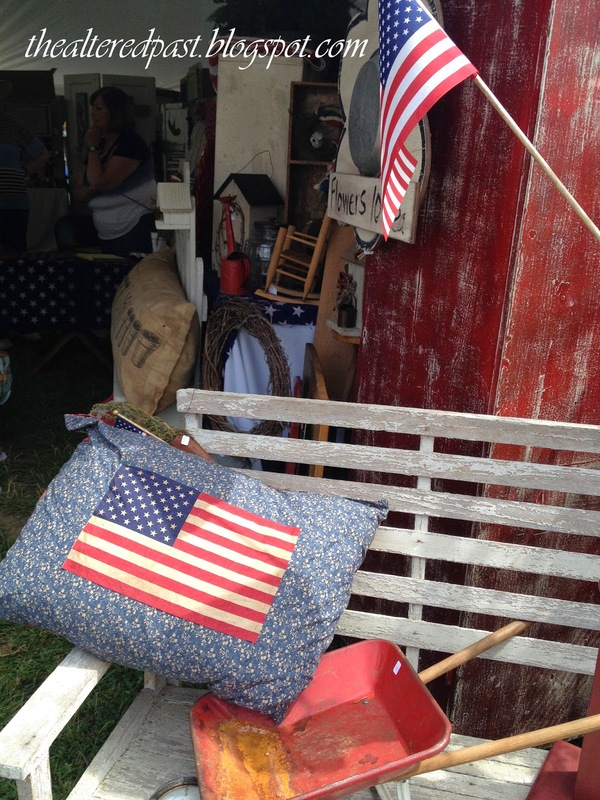 The Barn Sale is being held at a beautiful venue called Events at East 96 and there were LOTS of great vendors there. I got a few pics, so, let's get to looking around! 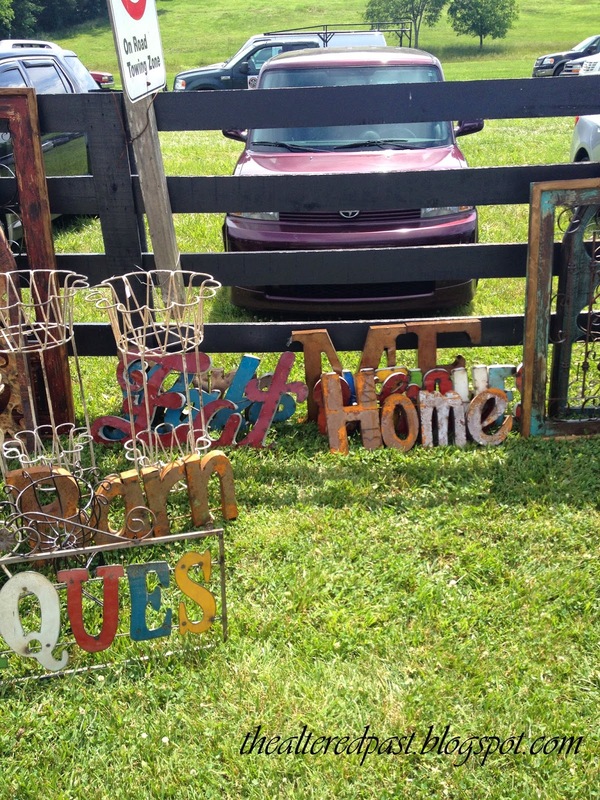 J. Alexander Home's booth had these great vintage metal signs. There is an aqua LAKE sign in the back that I really wanted...for the lake house that I don't have. Oh well, a girl can dream. 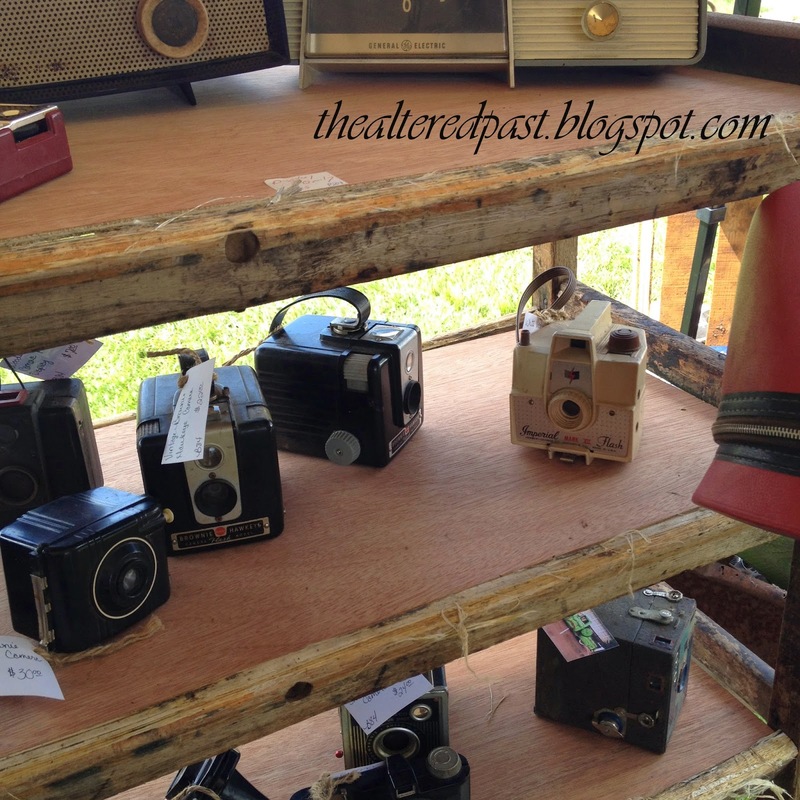 The vintage cameras are from Rust Bucket Antiques. 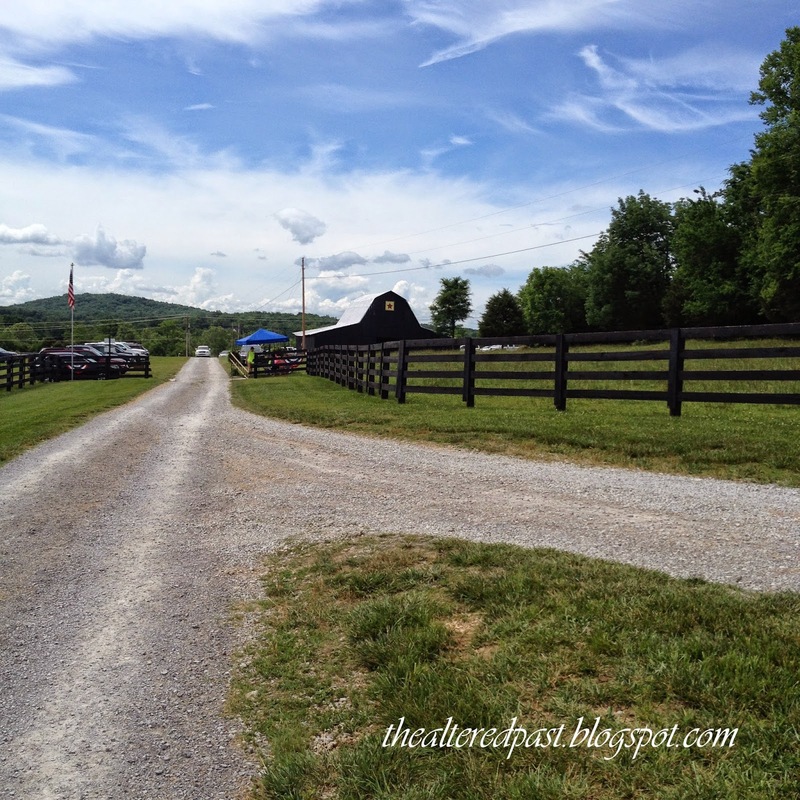 Wait until you see his truck that he brought/drove to the Barn Sale. I thought the Toms display stand would be great in a kitchen for coffee mugs in my daughter's new apartment. She doesn't move in until mid-July, so at $40 each, I decided to pass them up for now. Ok, so here it is! 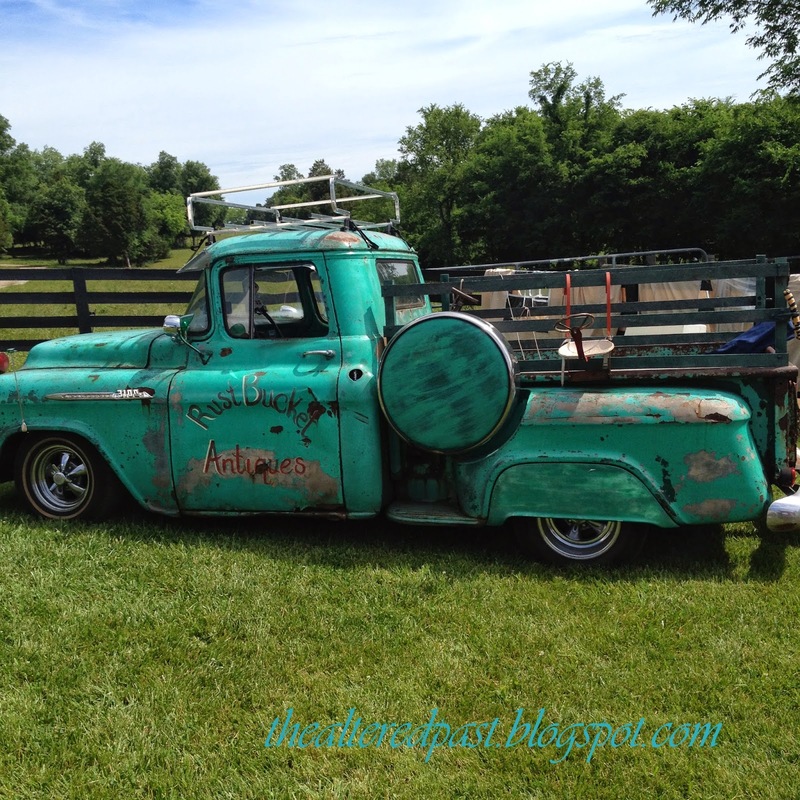 This is "Rust Bucket's" awesome, vintage blue truck! Yes, it runs and he drove it to the Barn Sale, loaded with all sorts of great rusty items. If you look closely, you can see an old car seat hanging from the side of the truck. Can you believe kids actually rode in those IN cars?! Like the old saying goes, "It's a wonder we ever survived our childhood!" Glad things have changed in that area. Ok, if there's one thing I love more than red/white/blue, it's PLAID! 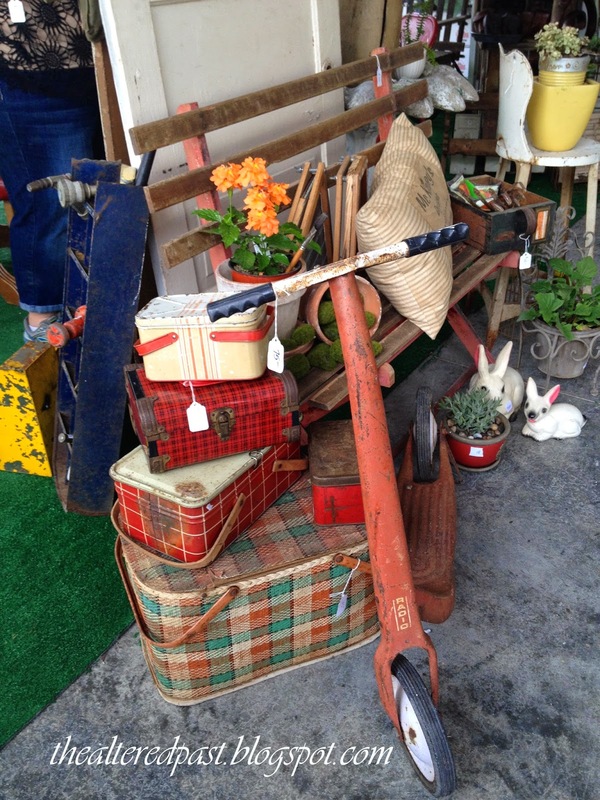 Love these vintage lunch boxes and picnic baskets. And that red scooter! This booth belongs to Polly of Blackberry House. They had a store in Murfreesboro until recently. Polly, an interior designer by degree, developed her own line of paints. The paint line has grown so big, she sold her store and inventory and will be concentrating on just her paint and related products. 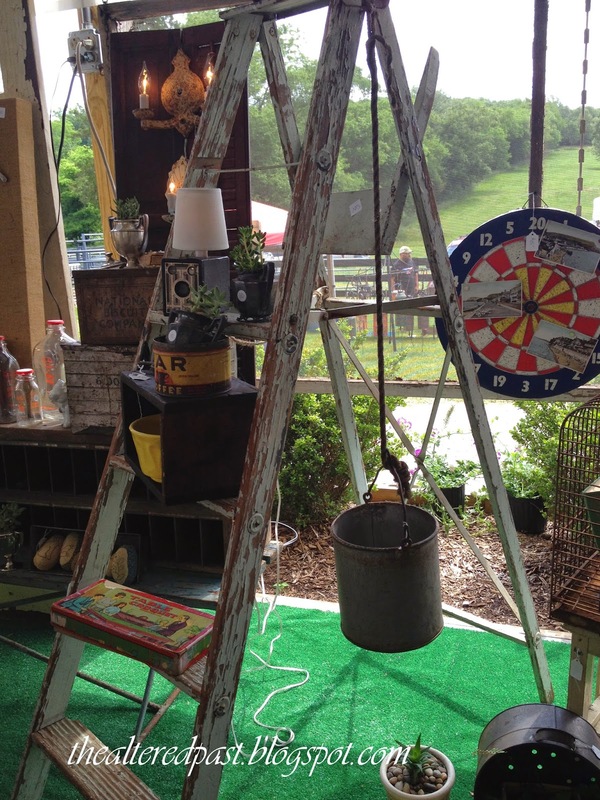 Another shot of Blackberry House's booth, vintage ladder, succulents in vintage silver, and in the background, an incredible post office cubby...which had already sold. 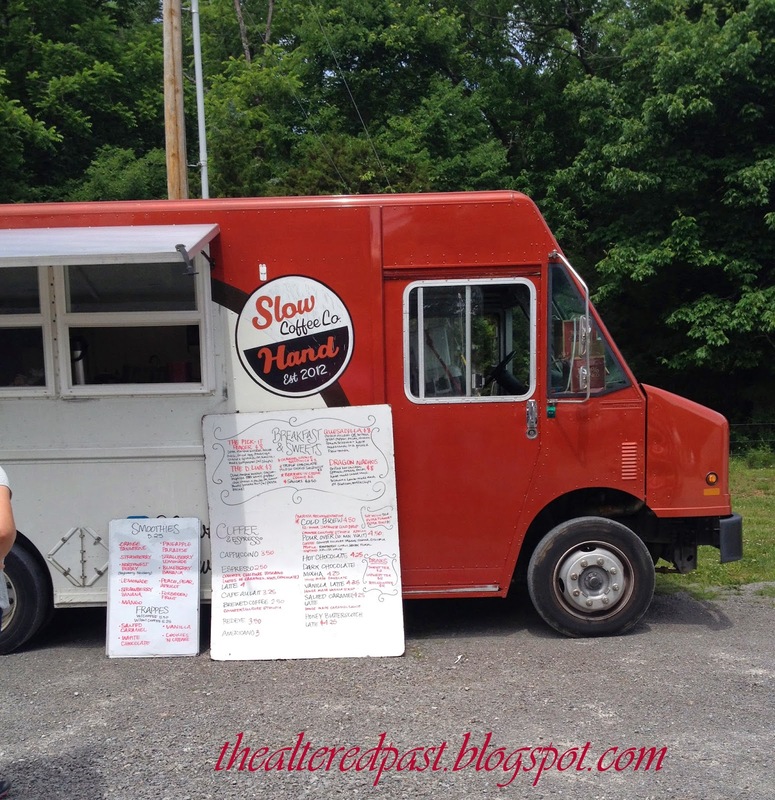 There were also some food trucks on hand. 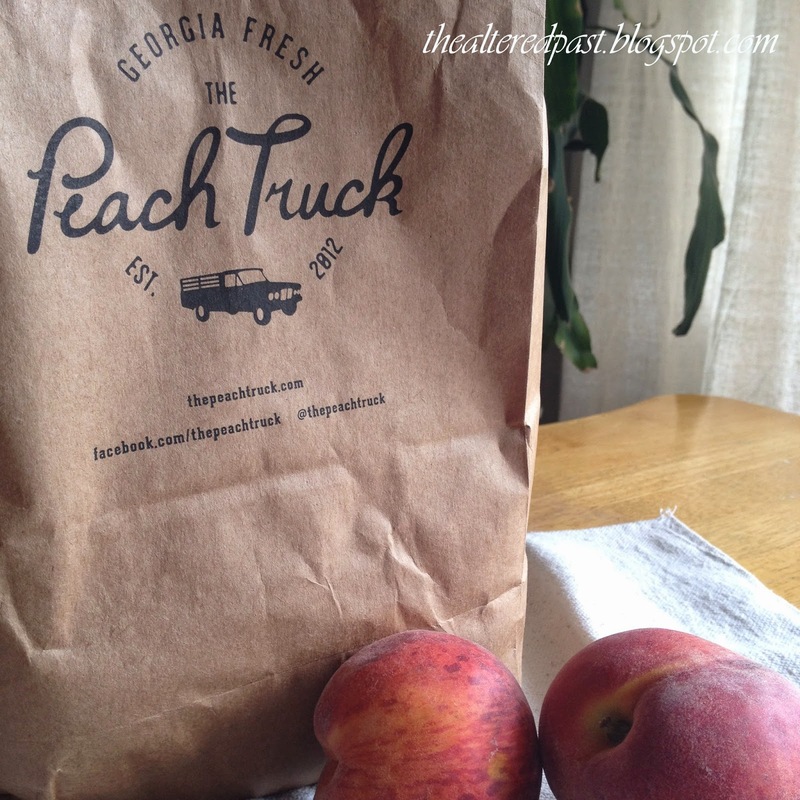 It was still early when we left so I didn't get to sample any of their goodies. 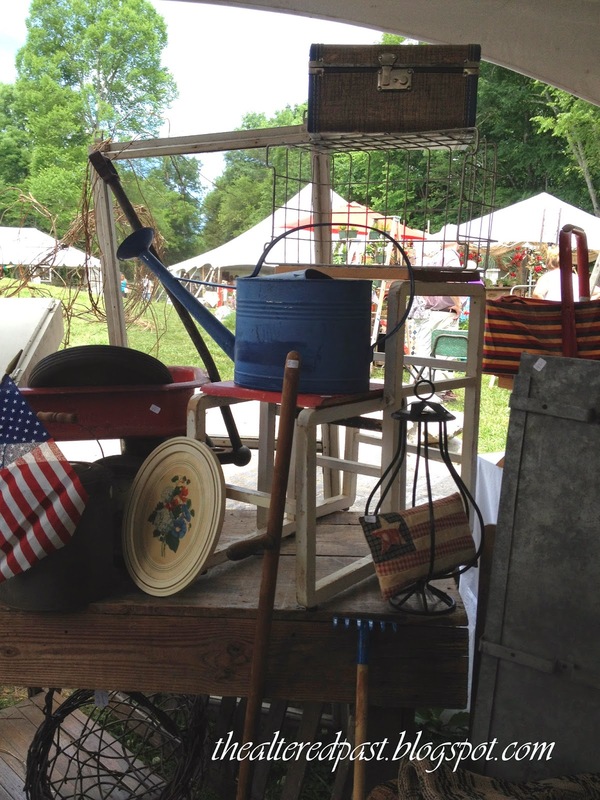 If you get a chance this weekend, check out The Pick-It Fence Barn Sale in Lascassas, Tennessee. The venue alone is worth visiting. Swings for those tag-a-long husbands and kids! 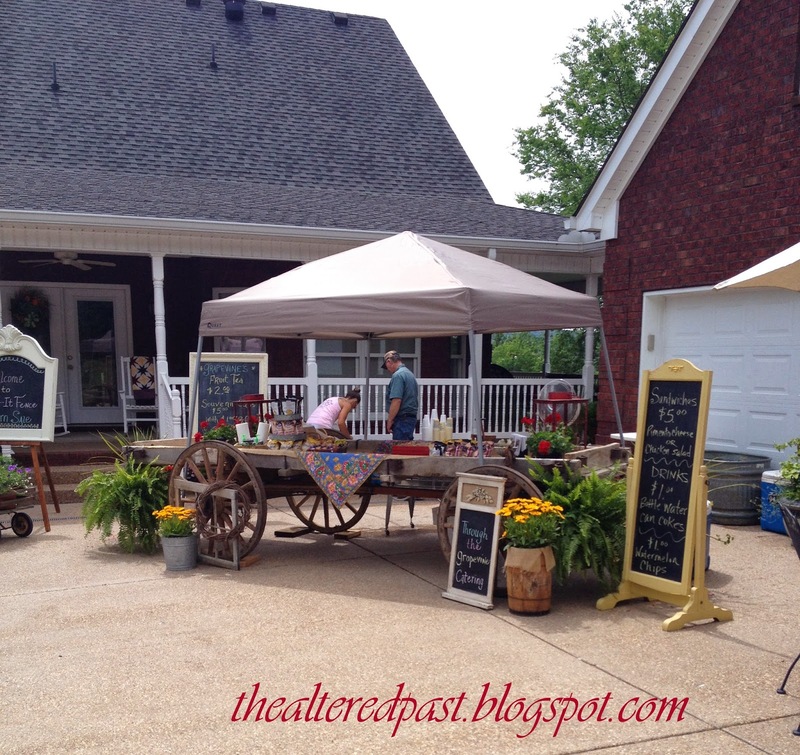 The front barn, being set up for a wedding. 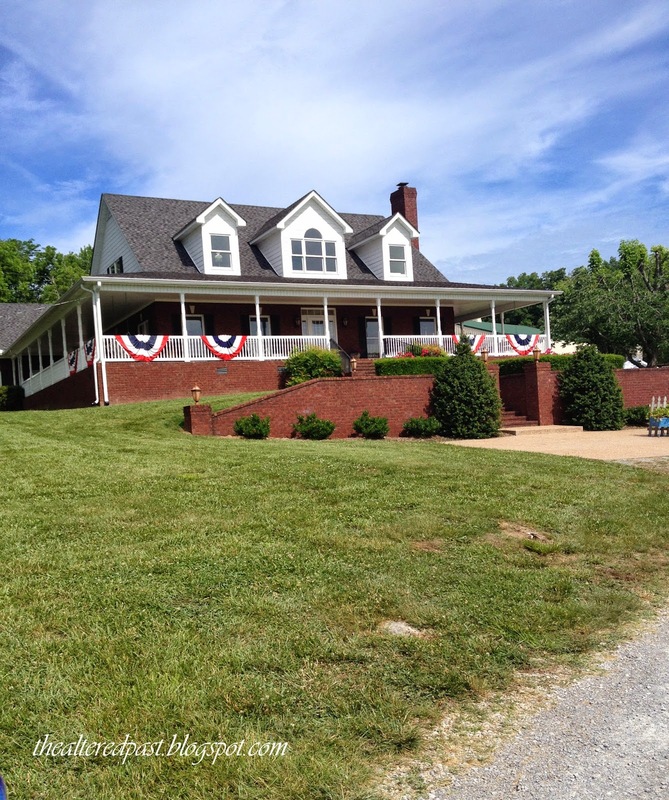 The property is owned by a local restaurant, Through the Grapevine, one of my favorites in Murfreesboro. 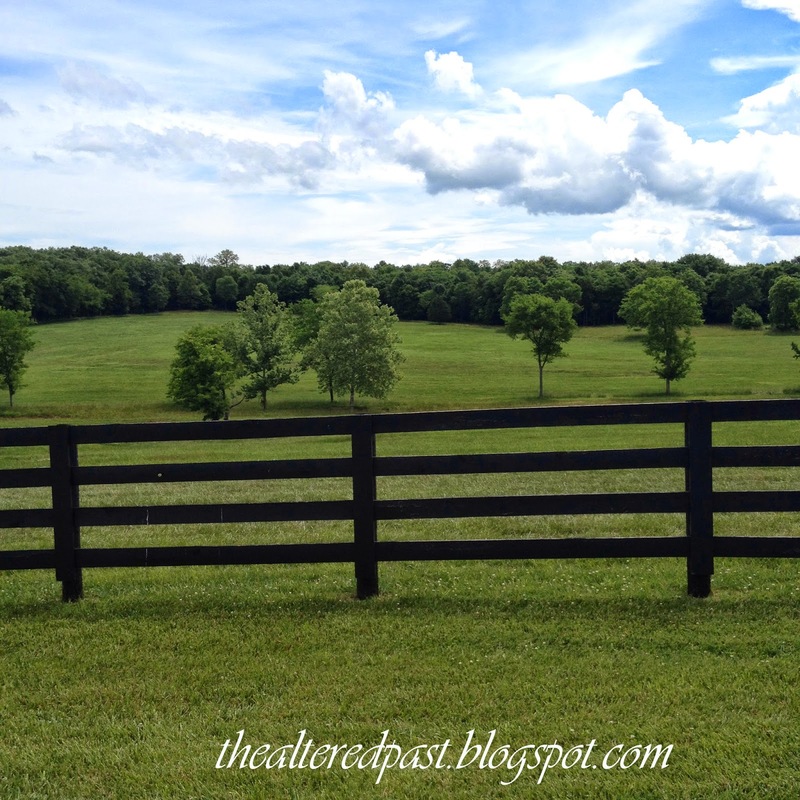 They host a lot of beautiful weddings, dinners, and other get-togethers. 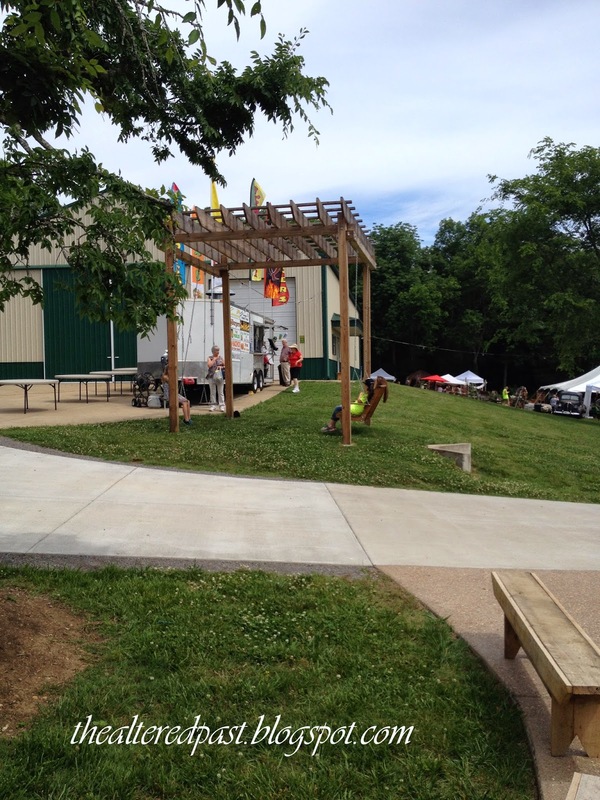 If you're ever in need of a venue, be sure to check them out. The view's not too shabby either! 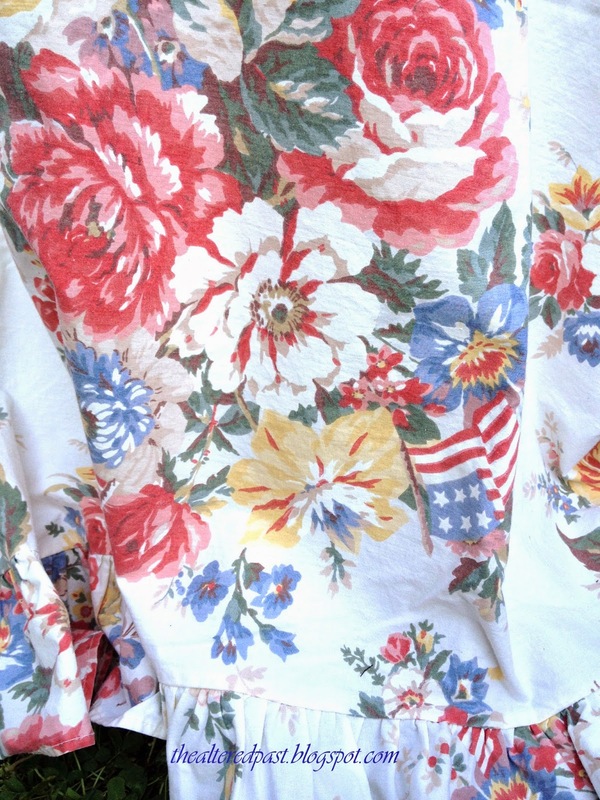 I love anything red, white, and blue. Make it a holiday where I get to decorate using those colors and it's just the icing on the cake for me. 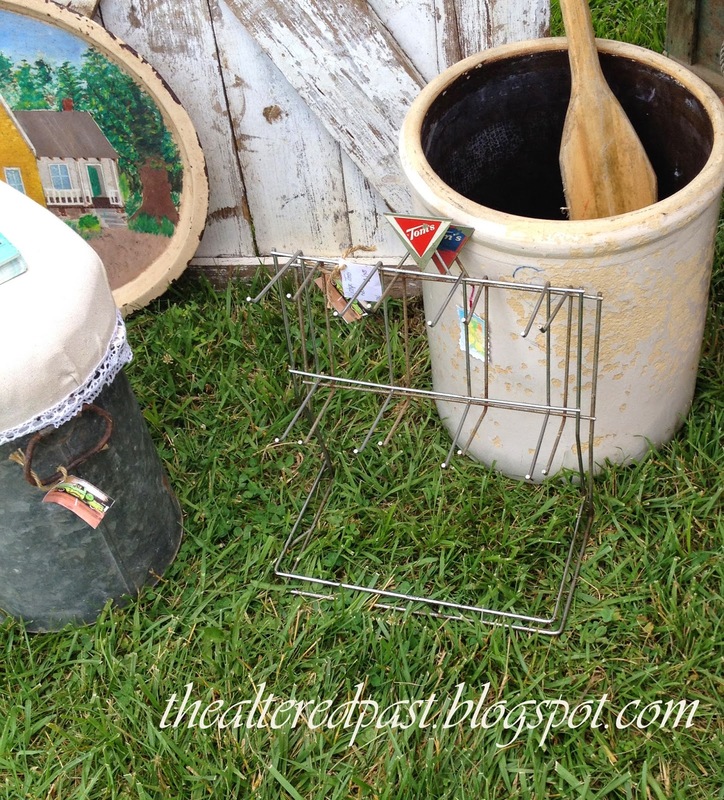 I store my linens and decor in totes based on holiday or color themes. 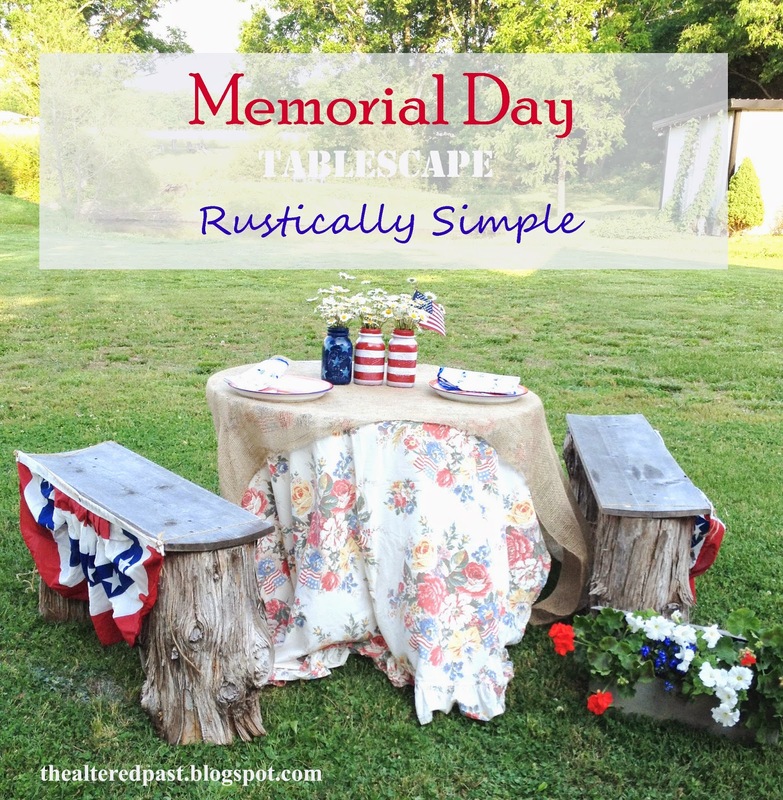 So, yesterday afternoon, I pulled out my red, white, and blue tote and put together this Memorial Day tablescape. 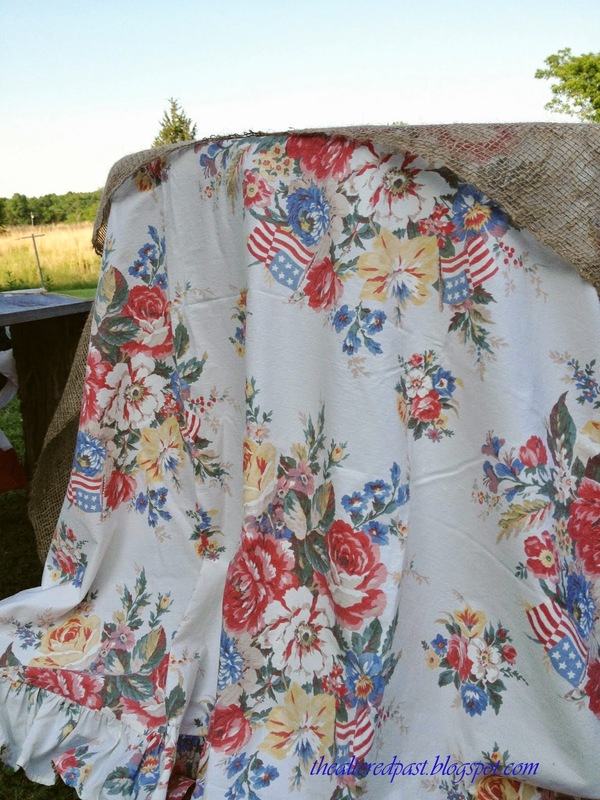 I began by layering Ralph Lauren's "Dylan's Grove" sheet and a simple piece of gardening burlap on my patio table. I picked up this sheet at the thrift store and I would love to complete the set but the queen set on eBay goes for $350! I'll keep checking the thrift stores, thank you. 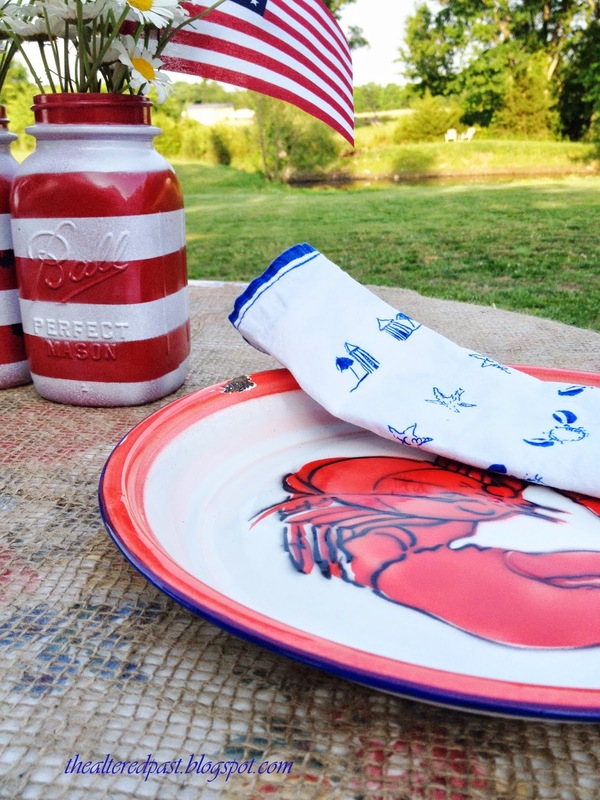 I guess I'm still in a beach frame of mind since our vacation so I pulled out my enamelware lobster plates for the place settings. 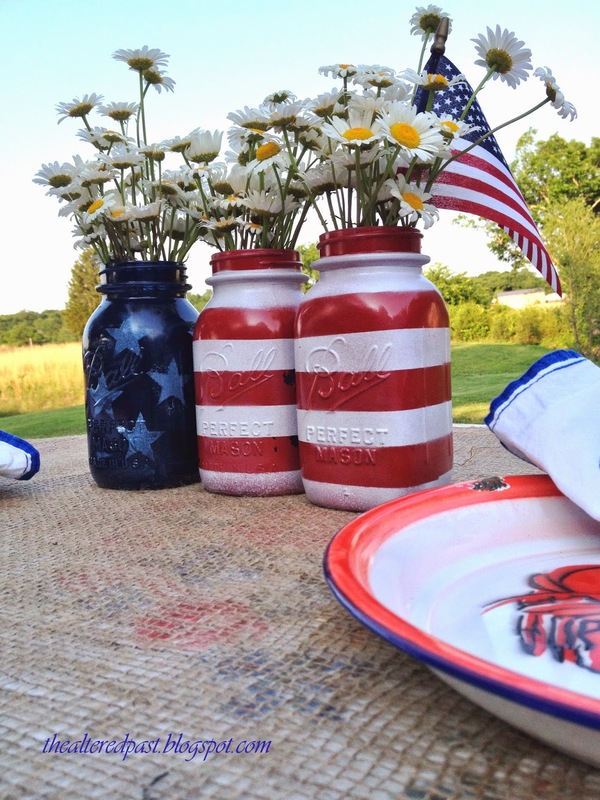 Added a blue and white cloth napkin and the mason jars that I painted (idea found here) and the table was set. 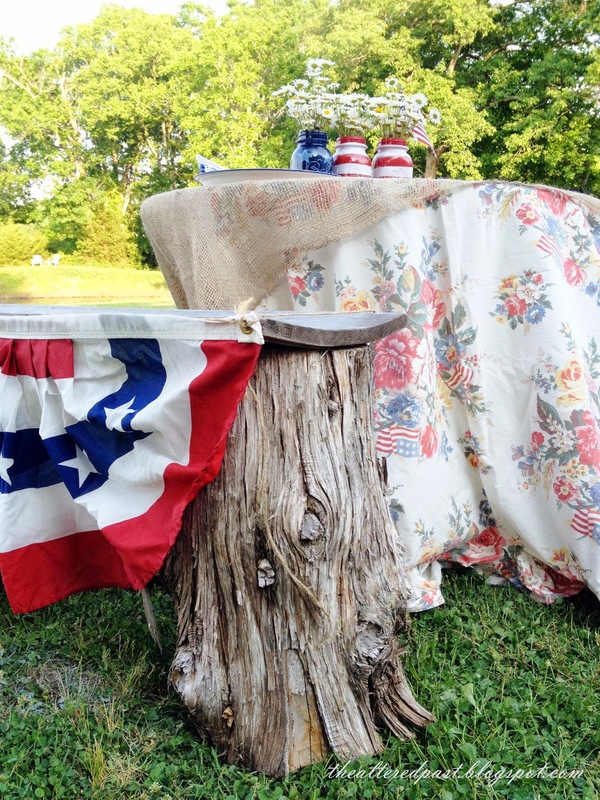 I purchased the buntings from Old Time Pottery many years ago. I dreamed of using them on my front porch. I didn't quite think it through when I bought them because our front porch has arches and hanging the buntings in the arches just looked wonky. More like pathetic. No matter because I found another use for them yesterday. My youngest made these rustic benches using scrap boards and cedar logs. I love them! 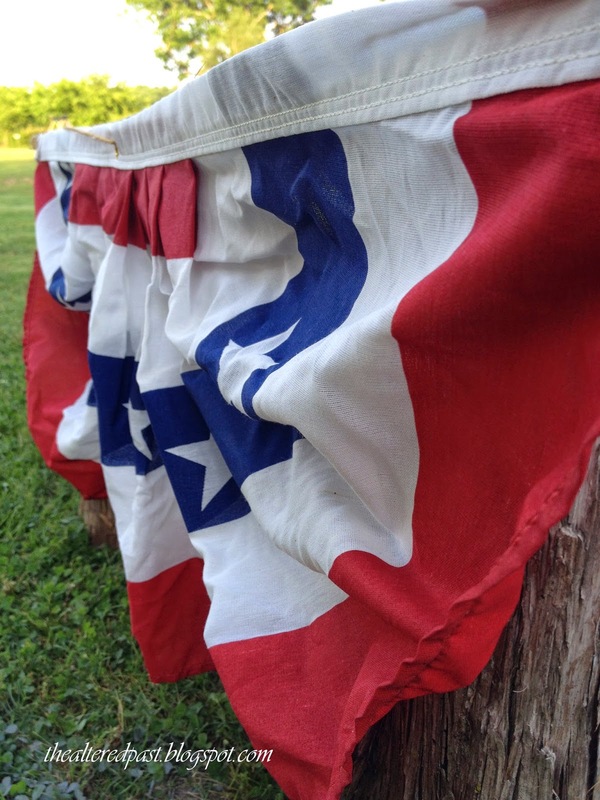 The buntings fit perfectly across the back. The last thing I added were some flowers to my metal tool box. Did you know red geraniums are the most popular color? I didn't either. I took me going to three stores to find red. I was obviously behind the holiday-weekend-planting-crowd. 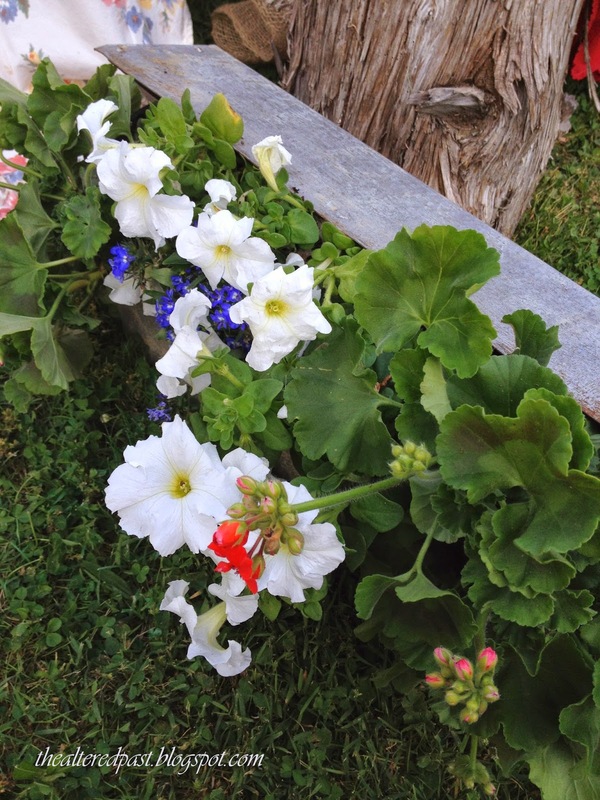 I used two red geraniums, two white wave petunias, and one blue lobelia. One lobelia because it was the ONLY blue plant left. Yep, behind the crowd. I hope you enjoy your Memorial Day weekend. 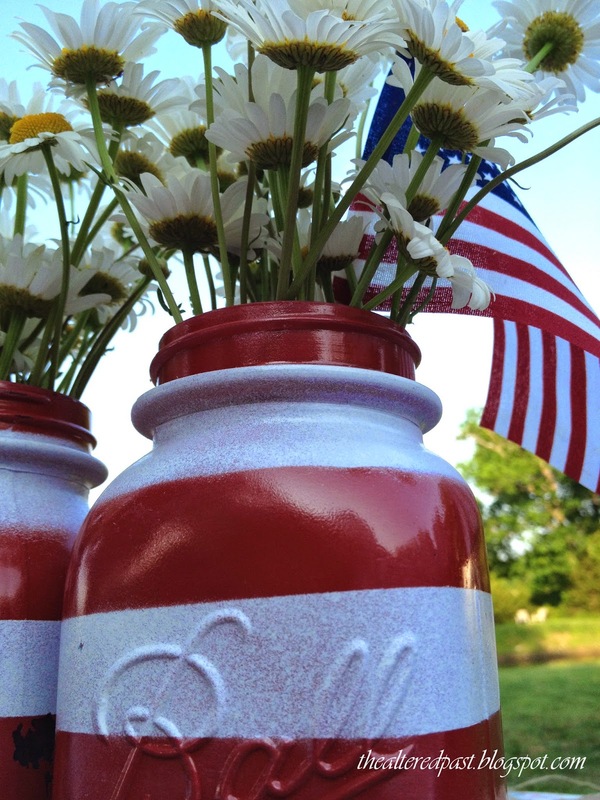 Please don't forget it's about remembering and honoring those that have served for our freedom and our rights. They sacrifice so much and something receive so little in return. Thank you to all who are serving or have served our country! Thank you to the families of those heroes too! 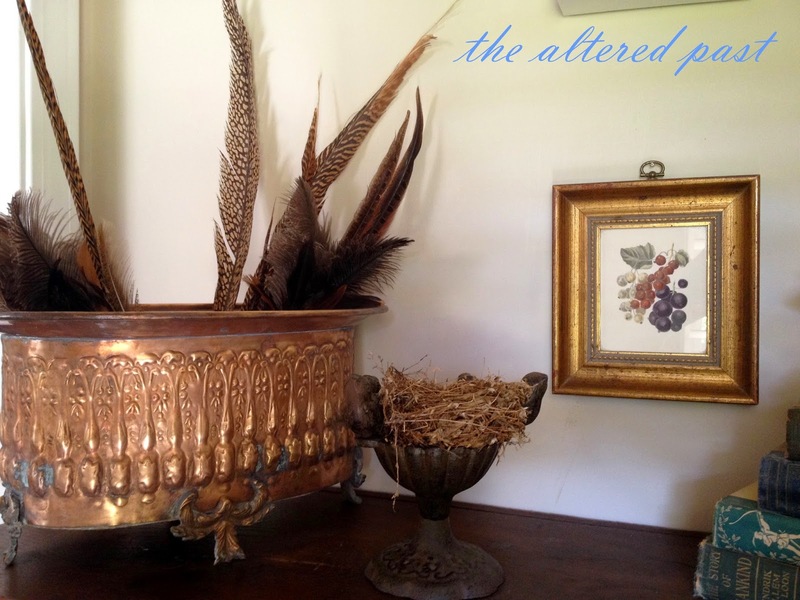 A couple of years ago I stopped by a yard sale and found a large brass planter. It was pretty tarnished but for $2, I couldn't pass it up. I brought it home and planted it with succulents and stuck it on the table on the deck. Fast forward to a few weeks ago when I began sprucing up the deck for spring and found the planter...dead succulents, lots of dirt, and plenty of tarnish. I decided it was too pretty to just waste away on the deck so I brought it inside and began to restore it to its former beauty. I found Bar Keepers Friend several years ago and have used it religiously ever since. I first discovered it while looking for something to clean the marks off of my white porcelain sink. You know the ones that e-v-e-r-y pot and pan make on your white sink?! 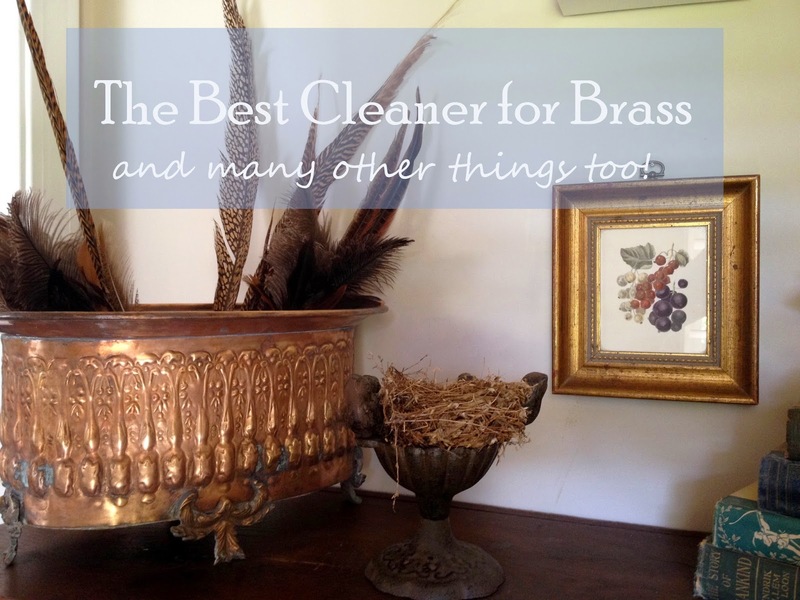 So I pulled out my trusty cleaner and began scouring my brass planter. It didn't take a lot of elbow grease and the old toothbrush came in handy for the small areas. Isn't it beautiful? I had a pot of shamrocks in there until recently...brown thumb, had to throw them away. 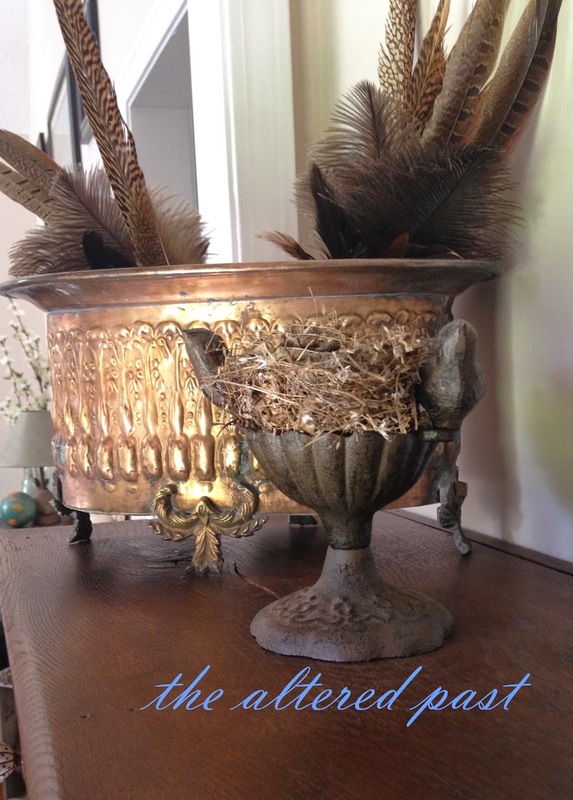 I just stuck the feathers in to go with the bird nest in the iron piece in front of the planter. The planter is sitting on top of my grandfather's old pie safe. It's one of my favorite pieces in my home. I still remember it sitting in their basement filled with old gardening tools. 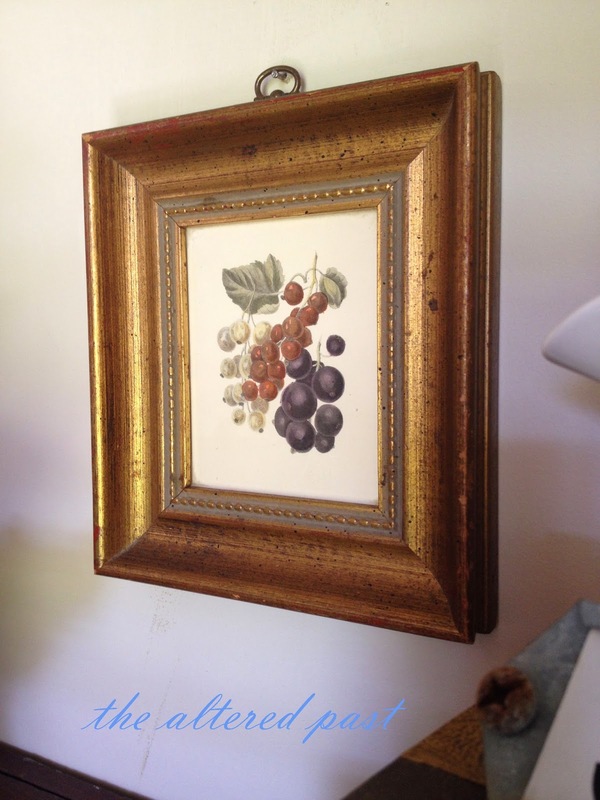 The little lithograph print hanging on the wall in this vignette was also purchased at a yard sale about 20 years ago, possibly THE best yard sale I've ever been to! This print was $1. 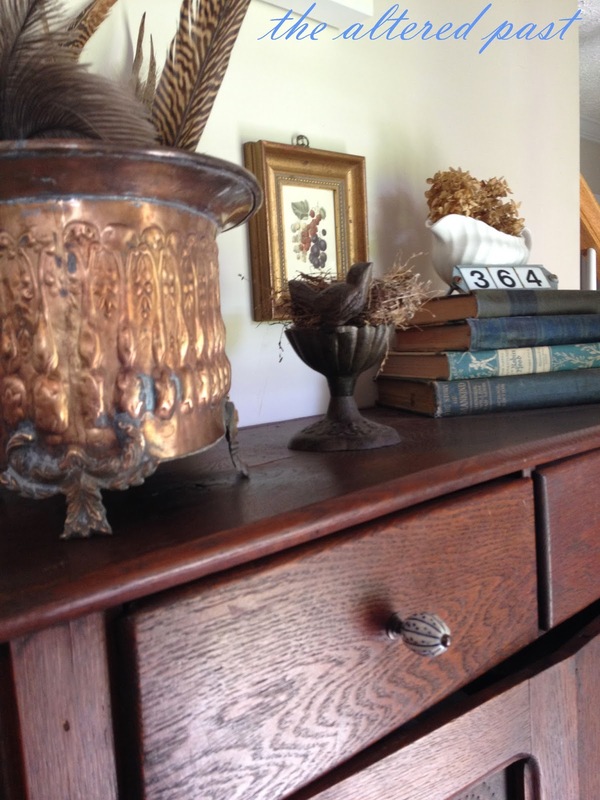 I also purchased a huge wooden bowl with a teal stripe around the outside and sailboats painted on the stripe and a gorgeous pair of brass and crystal sconces. Again, for $1 each. Why oh why did I sell those?! Still kicking myself. Back to the best brass cleaner ever. Bar Keepers Friend is an amazing product. Like I said, I use it on my porcelain sink, pots, pans, copper, and fiberglass shower/tub. 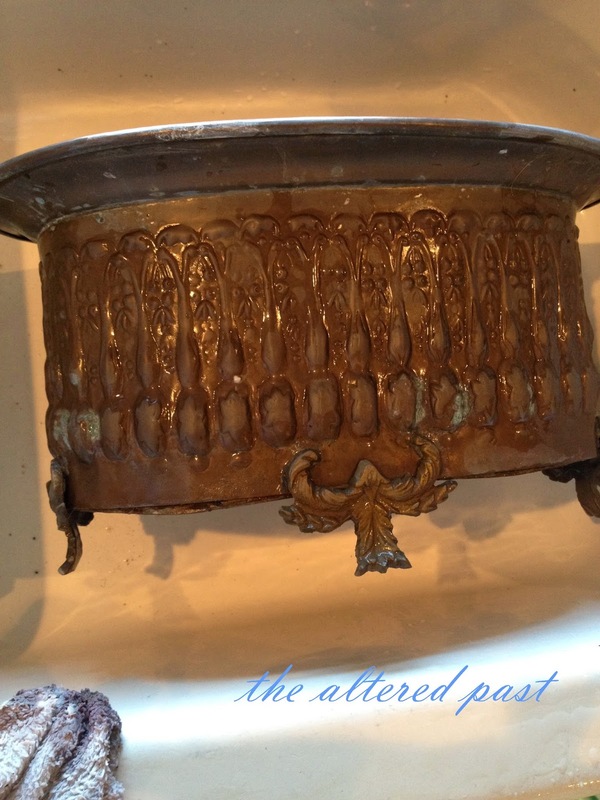 I does say NOT to use on silver but I confess, I purchased an old silver punch bowl (see that post here) that just would not clean up. 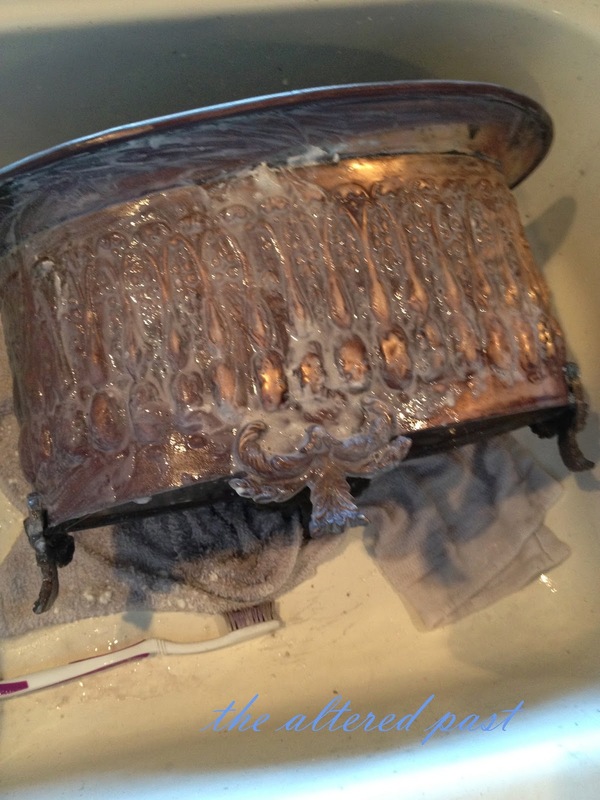 I tried all the typical silver cleaning tricks, Wrights Silver Polish, and even bought a bottle of Tarnex. Nothing. Nada. The tarnish would not budge. So I went against the directions and used Bar Keepers Friend on the silver punch bowl. It turned out beautiful! Warning, it may scratch! I had no other options and it worked for me. This post was not sponsored by Bar Keepers Friend. It is just my honest opinion of a product that really delivers. I was not compensated in any way for this post.